Health insurance is changing under the Affordable Care Act. Starting on October 1, 2013, people who are uninsured or who buy their own coverage can sign up for health insurance through the Health Insurance Marketplace. Why write about this now, if enrollment doesn’t start until October? Because we’ve already heard from consumers and other federal agencies that scammers are trying to convince people to act, and give up money or personal information. Scammers want to get to you before you have time to think. It’s summertime. For kids, that might mean days at the pool, sleep-away camp, summer school…and hours on some computer or mobile device, if they can possibly get away with it. Starting today, parents might feel a little better about their younger kids’ privacy online. That’s because changes to the Children’s Online Privacy Protection Act (COPPA) rule take effect today. The act requires operators of websites or online services directed to kids under 13 to give notice to parents — and get their verifiable consent — before collecting, using, or disclosing a kid’s personal information. The rule also applies to general audience sites that know they’re collecting information from kids under 13, and to sites and online services that have actual knowledge they’re collecting information from sites directed to children. The rule applies to apps, too, not just to websites. 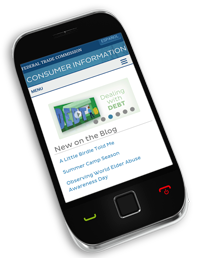 If you want easy access to reliable consumer tips and advice while you’re on-the-go, check out the Federal Trade Commission’s (FTC) new mobile-friendly navigation for our library of consumer information. Today marks the 10th anniversary of the opening of the National Do Not Call Registry. What a fitting day for the FTC’s announcement of the biggest civil penalty ever collected in a Do Not Call case. Do you trust people more if they’re like you, or a part of your community? Scammers bet that you do. Every day, they take advantage of that unconscious trust. It’s called “affinity fraud” — when someone in a group uses their membership in that group to scam another member. Think religious, ethnic, or professional groups. Might you be willing to hear more about a deal if a member of your church asks you to? Or take advice from someone who speaks your same language? Through the FTC’s Legal Services Collaboration, we’ve heard of cases just like that. If you’re headed to Chicago for the American Library Association’s Annual Conference, swing by to say hello. FTC staff will be at Booth # 934, ready to hand out our materials – all free, all the time – and talk about how to use them in your community. If you want a little more detail, come to my poster session, Saturday June 29, from 2:30pm to 4 pm. I’ll be talking about our innovative collaboration with the Center for Applied Linguistics to create materials for people who have consumer questions and want basic information. Military Consumer Protection Day is right around the corner! Mark your calendars for July 17. To get in gear, we’re hosting a Twitter Chat June 26 at 2pm (EDT). Staff from the FTC, DoD’s Military One Source, and Military Saves will answer questions for 60 minutes about buying a new or used car and other issues related to vehicles. To participate, follow @FTC and Tweet questions with the hashtag #mcpd or #MCPD. Are you a servicemember who’s curious about credit? Or are you dealing with debt? Maybe you’re a military spouse who wants some tips on managing money. Then join us for a Twitter chat about consumer protection issues on June 19 at 2 p.m, Eastern. FTC staff – and our partners at DoD, the Consumer Financial Protection Bureau’s Office of Servicemember Affairs, and Military Saves – will answer questions for 60 minutes on credit, debt, and savings. To participate, follow @FTC and Tweet questions with the hashtag #mcpd. Aah, summer break. School’s almost out, and camp season is just around the corner. Whether your kids are attending a program for sports, arts, or education, there’s plenty of fun to be had this summer…and plenty of forms to be filled out. Summer program forms may require you to provide your child’s personal information — like their Social Security number. While this may seem routine, it’s important to do what you can to protect sensitive information from falling into the wrong hands. Elder abuse is recognized by experts as a public health crisis that crosses socio-economic borders. Although millions of older Americans are abused, neglected, and exploited every year, an estimated 84 percent of cases go unreported.